The Second Epistle of Peter, often referred to as Second Peter and written 2 Peter or in Roman numerals II Peter (especially in older references), is a book of the New Testament of the Bible, written in the name of Saint Peter, although the vast majority of modern scholars regard it as pseudepigraphical. Second Peter quotes from and adapts Jude extensively, identifies Jesus with God, and addresses a threatening heresy which had arisen because the anticipated Second Coming of Christ had not yet occurred. It is the only New Testament book to treat other New Testament writings as scripture. 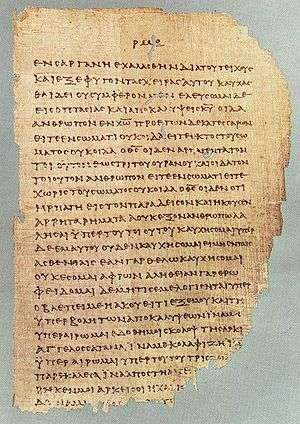 Second Peter was one of the last letters included in the New Testament canon and is one of the texts that were in dispute before the canon was finalized. According to the Epistle itself, it was composed by the Apostle Peter, an eyewitness to Jesus' ministry. It criticizes "false teachers" who distort the authentic, apostolic tradition, and predicts judgment for them. 2 Peter explains that God has delayed the Second Coming of Christ so that more people will have the chance to reject evil and find salvation. It calls on Christians to wait patiently for the parousia and to study scripture. The date of composition has proven to be very difficult to determine. Commentaries and reference books have placed 2 Peter in almost every decade from AD 60 to 160. Many believe that it was written between 65-68 A.D. because Peter was martyred around 68 A.D. by Nero and also because Peter references his approaching death in 2 Peter 1:14 ("since I know that the putting off of my body will be soon, as our Lord Jesus Christ made clear to me"). Most biblical scholars have concluded Peter is not the author, considering the epistle pseudepigraphical. Reasons for this include its linguistic differences from 1 Peter, its apparent use of Jude, possible allusions to 2nd-century gnosticism, encouragement in the wake of a delayed parousia, and weak external support. The questions of authorship and date are closely related. For Petrine authorship to be authentic, it must have been written prior to Peter's death in c AD 65–67. 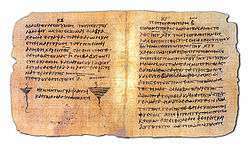 The letter refers to the Pauline epistles and so must post-date at least some of them, regardless of authorship, thus a date before 60 is improbable. Further, it goes as far to name the Pauline epistles as "scripture" — the only time a New Testament work refers to another New Testament work in this way — implying that it postdates them by some time. Chester & Martin say scholars consider the epistle to be written between c AD 100–150 and so contend that it is pseudepigraphical. For an argument for a late date see Harris. For a 'middle date' see Bauckham who opts for a date between AD 80–90 as most probable. For an early date and (usually) for a defense of the Apostle Peter's authorship see Kruger, Zahn, Spitta, Bigg, and Green. Jeremy Duff argues that the various strands of evidence "point towards the period 60–130 CE, with some reason to favour 80–90 CE." Acceptance of the letter into the canon did not occur without some difficulty; however, "nowhere did doubts about the letter's authorship take the form of definitive rejection." The earliest record of doubts concerning the authorship of the letter were recorded by Origen (c. 185 – 254), though Origen mentioned no explanation for the doubts, nor did he give any indication concerning the extent or location. Donald Guthrie suggests that, “It is fair to assume, therefore, that he saw no reason to treat these doubts as serious, and this would mean to imply that in his time the epistle was widely regarded as canonical.” Origen, in another passage, has been interpreted as considering the letter to be Petrine in authorship. Before Origen's time, the evidence is inconclusive; there is a lack of definite early quotations from the letter in the writings of the Apostolic Fathers, though possible use or influence has been located in the works of Clement of Alexandria (d. c. 211), Theophilius (d. c. 183), Aristides (d. c. 134), Polycarp (d. 155), and Justin (d. 165). Eusebius (c. 275 – 339) professed his own doubts, see also Antilegomena, and is the earliest direct testimony of such, though he stated that the majority supported the text, and by the time of Jerome (c. 346–420) it had been mostly accepted as canonical. In both content and style this letter is very different from 1 Peter. This epistle presciently declares that it is written shortly before the apostle's death (1:14). Arguments have been made both for and against this being part of the original text, but this debate largely is centered on the acceptance or rejection of supernatural intervention in the life of the writer. The epistle contains eleven references to the Old Testament. In 3:15, 16 a reference is made to one of Paul's epistles, which some have identified as 1 Thessalonians 4:13–5:11. The book also shares a number of passages with the Epistle of Jude, 1:5 with Jude 3; 1:12 with Jude 5; 2:1 with Jude 4; 2:4 with Jude 6; 2:5 with Jude 5; 2:6 with Jude 7; 2:10–11 with Jude 8–9; 2:12 with Jude 10; 2:13–17 with Jude 11–13; 2:18 with Jude 16; 3:2f with Jude 17f; 3:3 with Jude 18; 3:14 with Jude 24; and 3:18 with Jude 25. Because the Epistle of Jude is much shorter than 2 Peter, and due to various stylistic details, the scholarly consensus is that Jude was the source for the similar passages of 2 Peter. Tartarus is mentioned in 2 Pet 2:4 as devoted to the holding of certain fallen angels. It is elaborated on in Jude 6. Jude 6 however, is a clear reference to the Book of Enoch. Bauckham suggests that 2 Peter 2:4 is partially dependent on Jude 6 but is independently drawing on paraenetic tradition that also lies behind Jude 5–7. The paraenetic traditions are in Sirach 16:7–10, Damascus Document 2:17–3:12, 3 Maccabees 2:4–7, Testament of Naphtali 3:4–5 and Mishna Sanhedrin 10:3. The audience in this book are the various churches in Asia Minor in general. ↑ Erhman, Bart (2005). Misquoting Jesus: The Story Behind Who Changed the Bible and Why. Harper Collins. p. 31 "Evidence comes in the final book of the New Testament to be written, 2 Peter, a book that most critical scholars believe was not actually written by Peter but by one of his followers, pseudonymously.". ISBN 978-0-06-182514-9. ↑ Grant, Robert M. A Historical Introduction To The New Testament, chap. 14. ↑ E. M. B. Green, 2 Peter Reconsidered (1961) and other works. ↑ Jeremy Duff. "2 Peter". Oxford Bible Commentary. Oxford University Press. 2001. 1 2 Donald Guthrie, Introduction to the New Testament 4th ed. (Leicester: Apollos, 1990), p. 806. ↑ M. R. James, ‘The Second Epistle General of St. Peter and the General Epistle of St. Jude’, in, Cambridge Greek Testament (1912), p. xix; cf. Origen, Homily in Josh. 7.1. ↑ Donald Guthrie, Introduction to the New Testament 4th ed. (Leicester: Apollos, 1990), p. 807. ↑ C. Bigg, ‘The Epistle of St Peter and Jude’, in International Critical Commentary (1901), pp. 202–205; R. E. Picirilli, ‘Allusions to 2 Peter in the Apostolic Fathers’, in Journal for the Study of the New Testament 33 (1988), pp. 57–83; J. W. C. Wand, The General Epistles of St. Peter and St. Jude (1934), p. 141. ↑ Donald Guthrie, Introduction to the New Testament 4th ed. (Leicester: Apollos, 1990), pp. 808–809, though the exception of the Syrian canon is noted, with acceptance occurring sometime before 509; cf. Jerome, De Viris Illustribus chapter 1. 1 2 T. Callan, "Use of the Letter of Jude by the Second Letter of Peter", Biblica 85 (2004), pp. 42–64. Herbermann, Charles, ed. (1913). "Epistles of Saint Peter". Catholic Encyclopedia. New York: Robert Appleton Company.